Our business activities are infl uenced by a wide range of social developments. Among other things, these so-called “megatrends” include the continually increasing flows of goods resulting from the growing purchasing power of the middle class in the emerging markets. At the same time, the global limitations in available resources and coping with climate change pose major challenges. On top of this comes the demographic change which is making itself noticeable at a national level and the associated reduction in workforce potential. For us, dealing with these challenges, i.e. recognising the risks involved and developing appropriate solutions means conducting business sustainably. 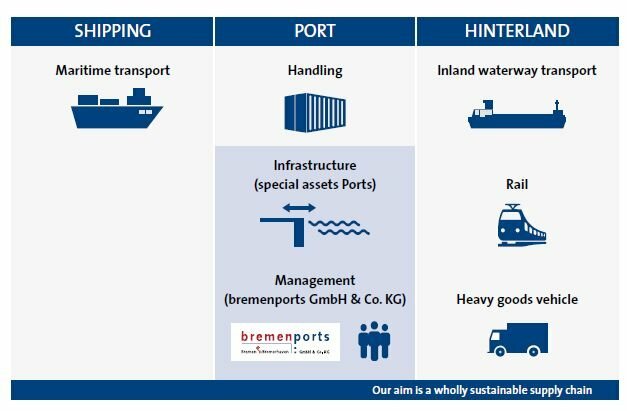 With our greenports sustainability strategy, we are following an integrated concept which links economical, ecological and social interests in order to ensure the future viability of the ports of Bremen. So far, we have been focusing our strategy on our direct area of influence the port management led by bremenports and the port infrastructure under the fiduciary management of bremenports. However, our long-term goal is to become part of a completely sustainable supply chain and to include shipping, port handling and hinterland Transport.